Add all the ingredients for sauce except corn-flour in a pan and slowly bring to boil. Mix corn flour with little water in a bowl and add it to the sauce. Slowly stir while heating till the sauce thickens. Heat oil in a wok or pan. Add garlic and fry till it turns golden brown. Add all the vegetables and stir fry for 4-5 mins over high flame. Add the prepared sauce, salt to taste and bring to boil. 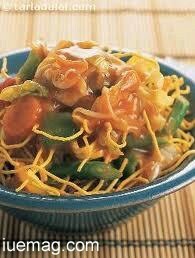 Pour the sauce over fried noodles on a plate and serve hot. Fried noodles is prepared by first boiling the noodles according to the instructions by the manufacturer. Then it is cooled and deep fried in oil.